One of Spider-Man: Homecoming’s biggest talking points is whether actress Zendaya will be playing Mary Jane. The former child star recently spoke about the type of role she would be playing opposite Tom Holland when the superhero flick swings onto screens in 2017 – and it sounds like she might be a different MJ to what people were expecting. “My character is not romantic,” Zendaya told THR, “My character is like very dry, awkward, intellectual and because she's so smart, she just feels like she doesn't need to talk to people”. That doesn’t sound like typical girl-next-door Mary Jane to us but it does sound like a well-rounded character whose purpose is not to exist solely as Peter Parker’s love interest. That sounds okay in my book. While there has been no official word from Marvel, it looks likely that Zendaya will be playing MJ, with several sources stating this is the case. There had been some (poor) reactions to the choice but many key Marvel names, including Stan Lee and Guardians of the Galaxy director James Gunn, have spoken up in support of Zendaya playing an African-American MJ. “People are going to react over anything,” Zendaya says, “But nothing is fact.” A leaked call sheet suggests she is playing ‘Michelle’ in the movie, this may be a distraction to avoid controversy. She's clearly having a lot of fun with this: “It's funny to watch the guessing game.” Zendaya said, adding, “But of course there's going to be outrage over that because for some reason some people just aren't ready." Aren’t ready for kickass MJ? We’re down with that. The actress is playing the cards close to her chest, that’s for sure, but we are excited to see a new-and-improved MJ alongside Peter Parker when Spider-Man: Homecoming arrives next year. 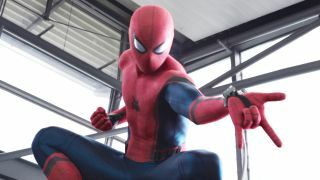 Directed by Jon Watts and starring Tom Hollander, Zendaya, Michael Keaton, Maria Tomei and Donald Glover, Spider-Man: Homecoming will hit theatres on July 7, 2017.